aparto student are a new student housing group, with residences currently in the UK and Ireland. Their focus is on the student experience, providing student homes not student rooms, to build a real sense of community. They approached BAM to help support their freshers tour for 2017. As a relatively young brand they were seeking increased brand awareness to ultimately grow their brand within this market. Freshers is the pinnacle time of year in the student calendar and offers the perfect opportunity to build brand awareness, engage with students on mass and collate a valuable database of student details through data collection. aparto student needed a branded set up that would enable them to stand out from the crowd and really make a visual impression, something that students could not miss. Attracting students is one thing, ensuring they engage with the brand is another. To ensure engagement and to capture that all important data for future marketing, a scratch card initiative was used where students had the chance to win some exciting prizes. The fitness bracelet in particular was a sought after prize. 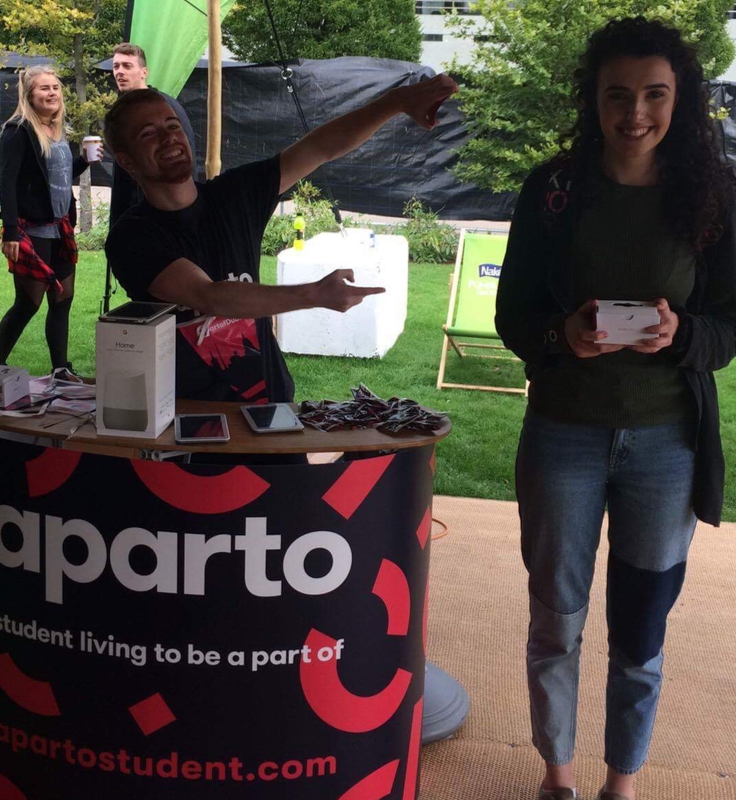 The wheels were set in motion and aparto student were set to take on the Freshers events and put their brand in the forefront of students minds. Touring a total of 9 Universities across the UK and Ireland, aparto student made a great first break into the student realm. With their first year under their belt, we are excited to see where aparto can take their brand in this market as we work with them to build on the success of 2017 with a bigger and better tour in 2018. “Working with BAM allows young brands like aparto student, the opportunity to raise brand awareness amongst students at freshers events, which is invaluable, providing a kick start to our marketing campaign for the upcoming year.